Quit it Already, Tap-Tap! is the final extra level in Yoshi's Island DS, and last in order in the game. As the title suggests, there are Tap-Taps in all four areas – in three, a Super Big Tap-Tap can be found. This is the only level where White Yoshi is seen morphing into a Mole Tank. White Yoshi begins the level near a Stork Stop and a ! Switch. They must run on various ! Blocks and land pieces, while a Super Big Tap-Tap tries to crush him. After a certain distance, Yoshi can hop onto a platform to grab a Flower. After reaching the top of a wall, the player can proceed to the second area. Afterwards, the player must use Baby Peach's parasol to ride the wind upward, avoiding chunks of land pieces, purple spikes, and another Super Big Tap-Tap. Near the door, the player can collect another Flower. When Yoshi enters the door, he is led to a corridor filled with Tap-Taps. By Ground Pounding a soft soil, he can enter an area infested with Tap-Taps, Coins and purple spikes, as well as an Egg-Plant. A Flower is found near an arrow-shaped group of spikes; the arrow points to a passage that contains a Chomp Rock and many Tap-Taps. 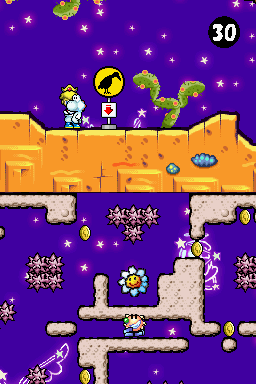 The player must get to a Mole Tank to dig their way up to a Flower, and then to an area with automatic vertical scroll. Dodging all the spikes allows them to reach a tunnel with even more Tap-Taps and spikes. By entering the door at the end of the area, Yoshi enters an enormous area where they must ride many Mine Carts to escape a third Super Big Tap-Tap; succeeding leads them to the final area, where the goal roulette is located. This page was last edited on April 5, 2019, at 12:19.